If you’ve been educated in the American school system at any time during and after the late 1960s, you’ve been taught that Margaret Sanger, had her emotions terribly wrung when she saw the terrible suffering poor women (mostly immigrants and blacks) experienced because they had child after child after child under the most appalling economic circumstances. To the extent Sanger was one of the major forces helping women break the cycle of annual pregnancies that destroyed their health and well-being, I have to applaud her. I don’t do pregnancy well and I’m not exaggerating when I say that a third might have killed me. 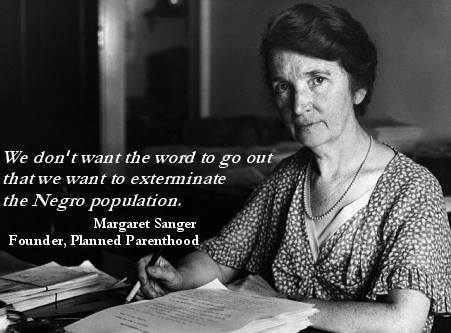 Sanger would undoubtedly be proud to learn that her beloved Planned Parenthood overwhelmingly targets African-Americans and other minorities. Incidentally, it’s recently acquired knowledge such as this, all of which runs directly counter to the careful myths on which I was raised, that makes me increasingly hostile to America’s abortion culture.